Not getting to work in my shop for a week, and I turn into my friend, Scott.....grumpy. So today, Inde pendence Day, I get some shop time. Next step in the sawbuck table project is to build the table top. I ran out of curly cherry, but have a huge stack of stickered and rough-sawn plain cherry in my garage. The boards are gorgeous and will darken quickly. However, yours truly, while having spent a great deal of time and care stickering & stacking the boards to allow them to dry (I bought them 2 years ago, freshly-sawn), forgot to put weights on the top boards. That resulted in twisted and cupped boards. So far, shop time is making me grumpier. The boards are too wide to face plane on my 6" jointer, so I reached for a plane that gets little use, but sure comes in handy when you need it.....a scrub plane. Scrub planes have curved irons that quickly remove deep, scalloped chunks of wood, enabling you to knock down high spots and correct twists in boards with little effort. After which, you can run the boards through your planer or switch to a less agressive plane. An added benefit: you can deflate your bad mood. Plowing through wood and seeing thick chips fly out of the plane's mouth is a real tension-reliever. And I'm happy to report—the grump has left the building. I have used a scrub plane for such a purpose before, as well, and it certainly works, but I have read somewhere (Chris Schwarz? Adam Cherubini? Not sure) that there is some evidence to suggest that the scrub plane was not actually meant for the face of a board, but rather it was used to avoid ripping a small amount (1/4"-1/2", say) off of a board to reach a certain width. I have tried it, and it is downright humbling how fast you can plane *past* your marks when 'ripping' with a scrub plane. The fore plane has less radius on the cutter, and a wider iron, for levelling faces. 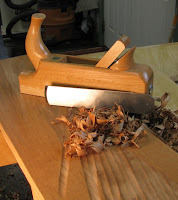 Again, different strokes for different folks, and I would be the last to suggest that a scrub plane doesn't work to speed up levelling a board. Glad to see someone else uses one too! As part of my training, my teacher had me scrub plane pieces of curly cherry and then follow up with planing the faces to thickness and the sides square to the faces. The first board took me over a week, but the second board took only fifteen minutes! You see when you take time to develop your skills with hand tools, you are taking time to develop yourself as a woodworker and craftsperson. You are making a connection between yourself and the tool and between the tool and the material. Yes, it can take more time, then if by machine, but that is time invested in becoming more complete in your craft. Scrub away Kari!! VC - I love my scrub plane - use it all the time. I've never tried the wooden ones like yours - that horn looks comfy but I think I would miss the tote. Mike - I think the scrub excels anywhere you need to remove wood fast! I use it to flatten and to “rip” – sometimes it’s faster than walking over to the saw till! It is my favorite way to make the 45 degree angles for French cleats – zip, zip, zip, then hit it with a jack plane and you’re done. Now who needs a table saw? Adam – I agree with the connection hand tools create. I used to feel like I spent all my time and energy setting up machines to do the work for me. Al, you are right about shop time. Getting even a tiny bit recharges my batteries. Metalworker Mike, I had never heard that before, but what a great idea. And it makes total sense. My scrub plane might get used more often now! Rgdaniel, I agree. Having the right tools also makes woodworking A LOT easier. Adam, that sounds like an excellent skill-building practice to flatten boards by hand. I rarely do it, but plan to do more in future. Working with hand tools certainly does provide a more intimate connection with your project. Dan, mine is an ECE plane and is very comfortable, but it's the only one I've ever used so I have nothing to compare it to. That's another great use for the plane---cutting a 45º angle. Thanks! Glad you had a great day in the shop. I got to spend the day playing, too. I'm not sure it's quite what my friends mean when they say "You need therapy, Vic!" -- but he may not have been the first. Warped boards: Depends on how you look at it. The benefit is that when boards warp while drying, they're now at equilibrium. Presumably, they'll not change structure again. Whereas if you **force** boards to be flat while they dry, then it seems like there's stored internal tensions -- ready to screw up your finished piece if it ever gets exposed to humidity.